South Australian Film Corporation, Seven Network. 1994. Director: George Ogilvie. Music: Carl Vine. CD (ST) Tall Poppies. TP024. (DDD). 1994. 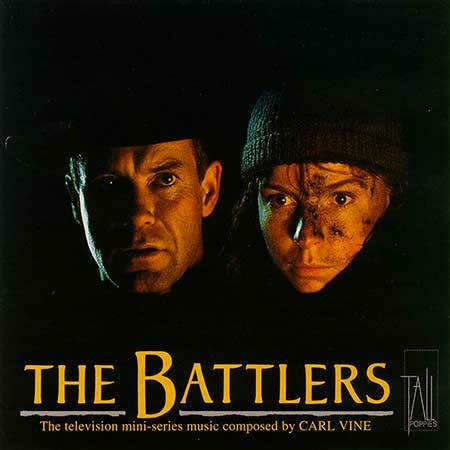 Music Composed by Carl Vine. Tall Poppies Orchestra. David Stanhope: Conductor. Dominic Harvey: Horn (6, 9, 16, 19, 23, 24, 26). Robert Johnson: Horn (1, 2, 4, 7, 11, 21, 25). James McCrow: Horn (3, 13, 20). Marshall McGuire: Harp. David Nuttall: Oboe. Jane Edwards: Soprano (24). Kirsten Williams: Violin. Violins: Kirsten Williams (Concertmaster). Leone Ziegler (Principal 2nd violins). Nadia Kelvin, Georges Lentz, Nicola Lewis, Benjamin Li, Leigh Middenway, Lev Novikov, Philippa Paige, Biyana Rozenblit, Deborah Scholem, Maija Verunica, Heather Westlake, Fiona Ziegler. Violas: Anne-Louise Comerford (Principal). Virginia Comerford, Janet Silverton, Leon Volovelski. Celli: Peter Morrison (Principal). Susan Blake, Anthony Morgan, Jane Williams, Barbara Woolley. Basses: Kees Boermsa (Principal). Neil Brawley, Dave Ellis, Kirsty McCahon. Timpani: Rick Miller. Recorded in Studio 200, ABC Ultimo. Recording Engineer: Neale Sandbach. Producer: Carl Vine. Mixing Engineer: Neal Sandbach. Digital Mastering Engineer & Orchestra Manager: Belinda Webster. Snow Confronts His Family. (3:45). Dancy And Jimmy Together. (2:16). Dancy And Jimmy Get Closer. (2:43). The Wedding And Prison. (1:53). Molly On The Warpath. (1:04).